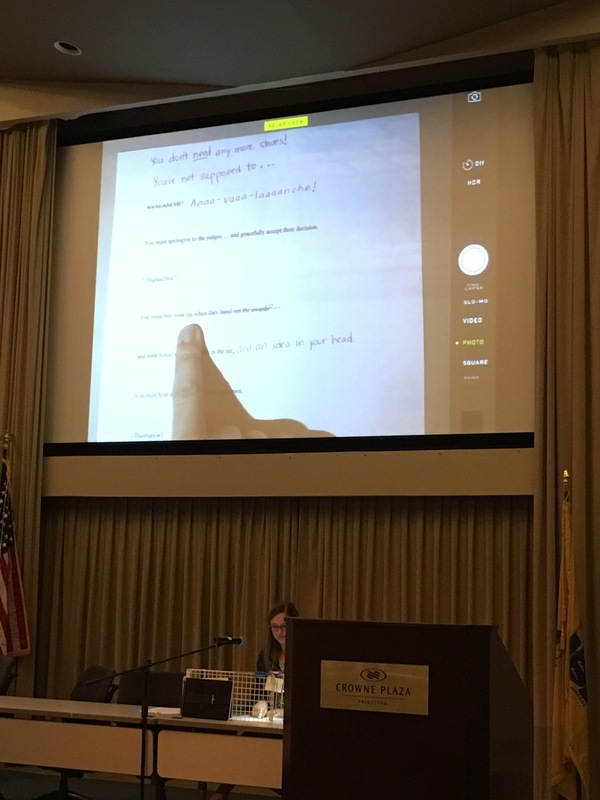 I’ve heard great things about the New Jersey Society for Children’s Book Writers and Illustrators Annual Conference, or NJSCBWI, ever since I joined SCBWI in 2013. Since I was unable to attend the Eastern Pennsylvania SCBWI Pocono Retreat this year (I attended it last year and plan to attend again in the future. 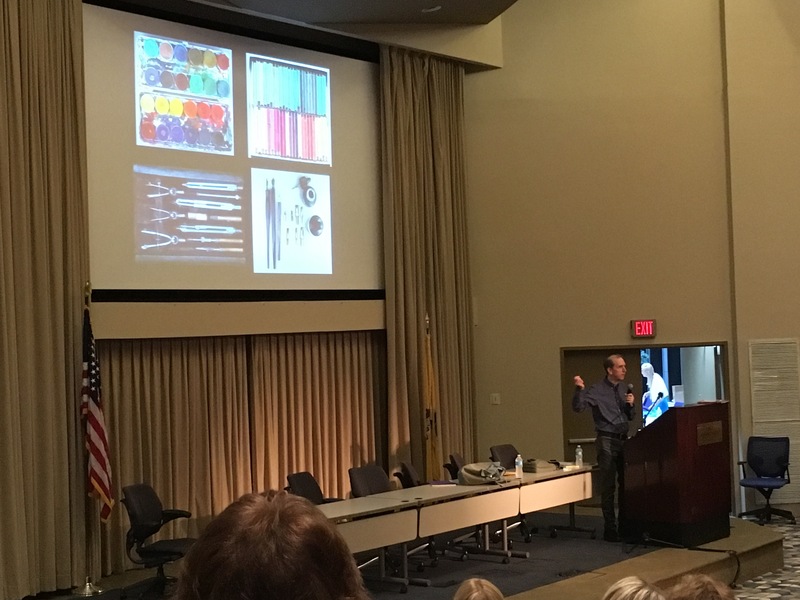 ), I attended the NJSCBWI Conference in Princeton, NJ this past weekend. The New Jersey conference is larger than the Pocono Retreat but more intimate than the Annual Winter Conference I attended in Manhattan in 2014. Just like the other two SCBWI conferences I’ve attended, I learned a lot this past weekend! While I was taking notes for the fiction-writer part of me, I was thinking as a writing teacher too. Here are some things I learned this weekend that can be applied to teaching writing to children. Some of David Wiesner’s favorite artistic mediums from his childhood. The three-time Caldecott Medal winner shared some of his childhood artwork with us during his speech. Wiesner’s parents saved all of his artwork from childhood. (They put me to shame since I do not save all of my daughter’s artwork!) Wiesner, himself, noted there was nothing remarkable about the artwork he created when he was five- and six-years-old. However, Wiesner’s point is that we can talk to young children about their own artwork and help them realize what possibilities may lay ahead as they grow older in life (e.g., a career in as an illustrator). Plant seeds of information, rather than painting full pictures. Allow your character to face consequences. Kill the character if s/he isn’t earning his/her keep. Brantley-Newton shared her personal journey as an author and illustrator with us. She stressed the importance of writing stories that resonate with us. She encouraged session participants to try writing stories about what you found interesting as a child, about vacations, or neighbors. This was yet another reminder we must work diligently to include window and mirror books in our classroom libraries. The original text was typed. The edits were handwritten in red. Bignell is a Senior Editor at Scholastic who took us through the editing process (from the first draft to F&G) of Madelyn Rosenberg’s How to Behave at a Dog Show. She had us read the first draft aloud. Once we did that, we discussed the strengths of the original manuscript. Then, we looked at the areas for problem solving (i.e., the needs). By the end of the workshop, we looked at the edited copy. At the end of the workshop, Bignell passed out F&Gs so everyone could see the finished product. When we talk about editing with our students, we can take them through another writer’s editing process (i.e., our own or a former student’s) if we are diligent about saving everything from the first draft to the final published piece. I think this is powerful work since students can realize the (revision and) editing process should yield something vastly different in the end. 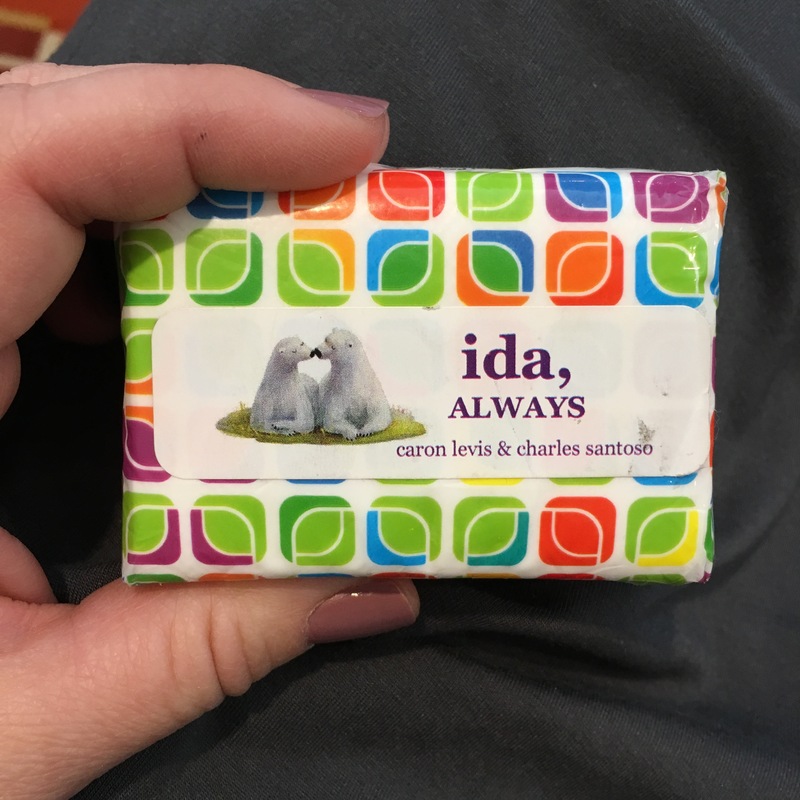 Levis carries around tissues as a promo item for her book. Thankfully, she had a pack to give to me! You’ll probably need tissues when you read the book too. During this session, I was introduced to Levis’ most recent book, Ida, Always, during this session. I listened to excerpts and ordered a copy of it on Amazon while I was sitting there. However, I couldn’t wait for it to arrive at my house, so I borrowed Levis’ copy to read at the end. I was teary by the end of the book since it was a deeply emotional ending. I’ll be reviewing Ida, Always next Friday here on TWT since it’s a mentor text you’ll want to have when teaching your students to write with greater emotion. How do we help writers — adults and kids — understand what voice is and how to recognize it? That’s a hard question! It’s one of those things you hear (or don’t) when you’re reading someone’s writing. As a result, Witte, who is a literary agent and author, showed us lots of examples of writing with strong voice. Certainly, this is something teachers can do with students when trying to get them to understand how to write with voice. Revision is not an attack on your book. It is part of the process. Deletion is a part of revision. Hear revision notes with an open mind. While revision is challenging, it’s also rewarding. This was a fascinating session for me even though I shouldn’t have been in the room since everyone else in the room was an illustrator. Even though I cannot draw a decent stick figure, I learned so much from Ericcson, who is a designer for Penguin and Nancy Paulsen Books. The session was all about picture book design, which fascinates me since so much thought goes into the book creation process. While I couldn’t find any classroom applications from this session, per se, it made me think of the Whole Book Approach, which I have blogged about a couple of times. If you don’t know about the Whole Book Approach to reading aloud, then click here to learn more about it. One of our missions here at TWT is to help teachers of writing see themselves as writers. How do you become a writer? You write. If you’re serious about writing or illustrating — beyond the work you do in the service of your teaching — I highly encourage you to attend a regional or national SCBWI conference in the near future. There’s no better way to be inspired to write than by being in the company of authors, illustrators, agents, and editors. ← Welcome to SOL Tuesday! Wow! Sounds like it was well worth your time and, thanks to your post, we will all be mulling over the conference for quite a while. Thanks! My pleasure, Kristi. SCBWI is a fantastic organization! What fabulous learning opportunities, for you as a writer, and as a writing guide for your students. Thanks for sharing the things that inspired you. My pleasure, Shari. Joining SCBWI has been a great gift. I wish I had the time (& money) to attend more conferences. I learn so much every time I attend one. You should seek out the old fiction UoS book from the 3-5 series. It came out in 2006. I think you would enjoy teaching it to your kids. Sounds good to me, Dana. Join the Slice of Life Story Challenge Community by sharing a story every Tuesday. Follow Two Writing Teachers on Pinterest. We hope you will help spread the word and join us for an important conversation tomorrow (Monday), 2/4, on Twitter. Each of our posts for this series, Teaching Writing with a Social Justice Lens, is now live on #TWTBlog (link in bio). Two Writing Teachers is licensed under a Creative Commons Attribution-NonCommercial-ShareAlike 4.0 International License.